Dorsamy (Samy) Goundar with Tania Houghton at Pact Group. Doing the best job for his customers is something he takes pride in so when they give great feedback he couldn’t be happier. “Building that customer relationship is very important and if you constantly do good work people will appreciate it,” says CrestClean’s Dorsamy (Samy) Goundar. 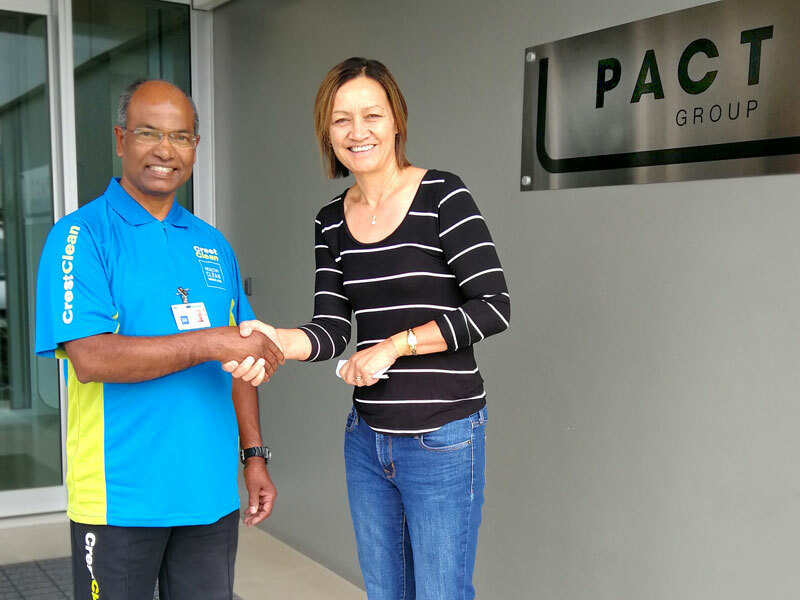 At Pact Group, where Samy has been working for five years, Senior Manager Tania Houghton says the high level of cleaning and the attention to detail has been impressive. “Five years ago, we were very fortunate to move into a brand-new building, and it was at this time that Samy and his team became part of our team. “We have 60 staff working in our office (covering two floors), so providing a healthy and clean environment is something we take very seriously. “It must be very challenging at times trying to keep 60 people happy, but I’m glad to report that Samy and his team do a terrific job. Tania says having CrestClean looking after the building’s cleaning needs brings peace of mind. “Communication is key to any good relationship and my team know that Samy is only a phone call away if an emergency crops up. Nivitesh Kumar, CrestClean’s Waikato Regional Manager, says Samy is not only a great operator he is an integral member of his team.